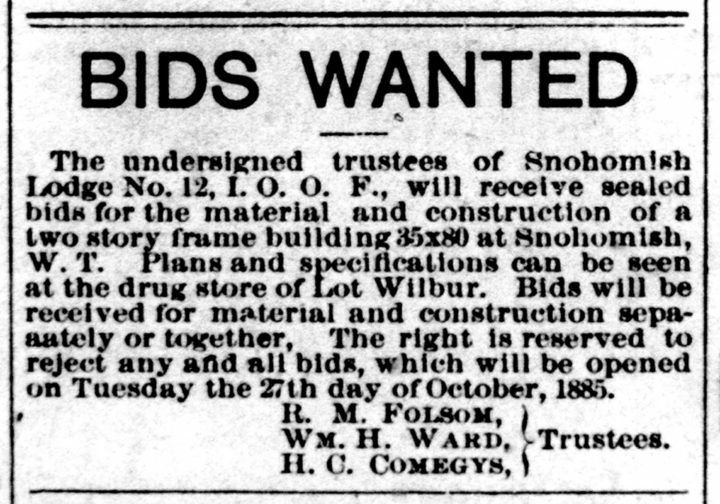 The call for bids appeared in the October 17, 1885, issue of The Eye on page three. Wish we knew how many contractors answered the call. For all the good the Odd Fellows organization did and are doing, saving records is not one of them. In 2012, I tried to track down any records from the Snohomish Lodge and I came up empty handed except for meeting the wonderful couple of Frank and Betty Green. From reading the accounts of circa 1885 Snohomish, I can remember coming across the names of only one contractor, A. H. Eddy; and one architect, P. Boyce — but J. S. White got the job. 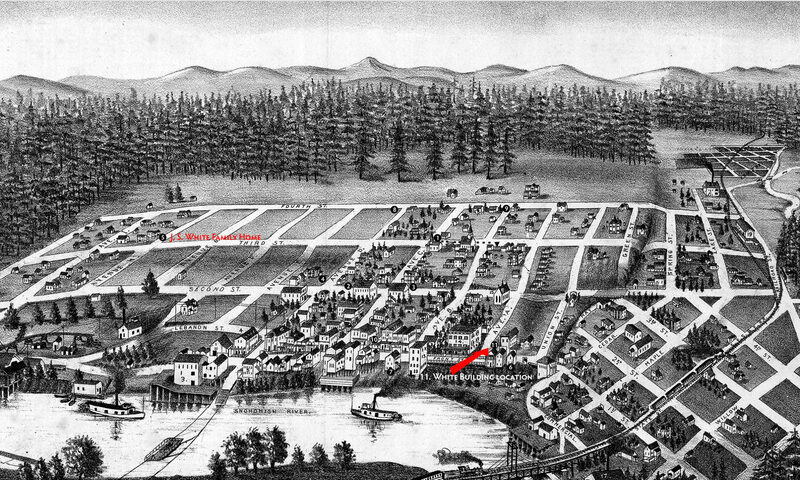 The Odd Fellows Hall, to the right of the Masonic Hall, was dedicated April 20, 1886. This scan of a newsprint photo by Gilbert Horton of the fraternal hall “face-off” across Avenue C was widely published. The Masonic Hall was built in 1879 and destroyed in 1958 by the members who sold the property as the parking lot it is today when the organization moved to it’s new building at 6th and Avenue B. Take note of the 100 foot plus flag pole, a very straight, long log, a little right of center — it has it’s own story. Next PostNext What’s with the Goat?